There's a good little Indian restaurant there, Calcutta Indian or something like that. It's in Ximending, but I don't know where exactly. The food isn't bad, but I just went to Out of India again in the Shida Market, and I don't know what they did, maybe they changed cooks, but their food is really good now. 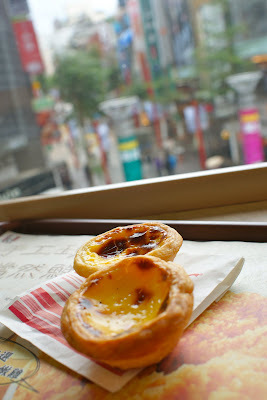 mmm egg tarts...i miss those so much. that's crazy that they have them at KFC though..never woulda thoguht that. guo tie is also fantastic. it's so cheap and delicious over there! Hi. I just found your blog a month ago. Just want to say thank you for your work. Next time I go to Taipei, I will stop by at Ximending and try some guo tie. Looks very nice! Thanks for this post! I will keep it in my mind when I visit Taipei :). The almond milk shaved ice is probably the most interesting item on the list for me :). That of course being that I have never tried it before, and the ice looks so fluffy! range: thanks for the reminder about both of those restaurants! I have heard of both but haven't been yet. i'll have to check out Out of India! brian: i know- very random right? north: hi! thanks for commenting. your blog seems off to a great start! they also have bbq stuff on a stick on the weekends and at night... those are so yummm!!! Terrific post! My cousins always take me the Ximending when I go visit. Next time I'll ask them to take me to these food spots. Roger is so lucky to have you as a guide! I thought he was in Taiwan after seeing his hilarious post on Eva Air food. hehe. Yeah Xiemending is a major hotspot...a dense population of restaurants in and around, multi-plex movie theater, and the occasional teeny bop boy band meet and greet plus promo performance. For those who can read Chinese there is a website called Shimen-walker I think ending in .com.tw but last time I tried surfing, warnings popped up, but it gives you a good idea of what to expect, as well as a fairly outdated but cool directory. Somewhere in the basement of a shopping arcade building about 5 mins away from the strip is a place called Lao Shandong that specializes in knife shaved noodles and dumplings, the place is easily 40 years old and pretty good. Literally next door to that is a place that specializes in Taiwanese style fried pork chops which Juma from Yelp LA (Taiwanese) also recommended. I agree on Ay Chung but that place is pretty much a standing noodle bar (no chairs or tables), one dish/item only and it is superb. Near the main road/closer to the MRT station, is a place whose name escapes me, but it's a whole 2 story restaurant that specializes in goose (Ya Rou Bian) that my brother in law swears by (another old school Xiemending fixture). Another place inside Xiemending mobbed by Hong Kong tourists and the ilk, is Lao Tien Loo Lu Wei, started by a Shanghainese immigrant (easily 50++ years old) who settled in Taiwan. Their marinated duck tongues are super popular and even has celebrity endorsements (including older photos) of HK mega celebs like Andy Lau. It's more of a to-go place, but it's definitely worth trying. 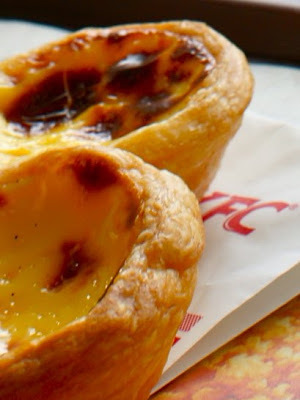 Never thought KFC XMD would offer Portugese style egg tarts. Is it that location only, or any Taiwan KFC? Although not food, Mag Freak is a pretty neat store specializing in magazines and books from Taiwan, Japan, Hong Kong, USA, Europe (mostly hobby, fashion, anime type magazines....including uhhh freaky stuff). lol I like how you caught my chopsticks mid-dip on the potstickers photo. Kirbie, I did indeed feel lucky to have the chance to hang out with Joan! kirbie: thanks!! if you make it back to taipei, i'll take you! or we can explore a different area! Azabu Sabo (Japan? chain of dessert and sweets restaurant) has a location in Xiemending, looks fancy fun too. How I miss eating in Taiwan. Lived there for years. My husband and I went last year for a visit and had An Chung Noodles. Yum! We're planning on returning next year and will most certainly be following your blog for updates and suggestions. Thanks for sharing! No visit to Ximending is complete without a trip to Yaroubian 鴨肉扁土鵝專賣店) at No. 98 Zhonghua Rd. Meiguanyuan is also a landmark--there was a nice write up in the China Times the other day as part of their new series of features on Taiwanese food. Also, the Red Theatre and the many gay bars and cafes there deserve a mention as well. There is a friend;y (but decidely so-so) Thai restaurant with outside seating and the small cafe at the opposite end is a great place to while away an hour or two over Belgian beer or coffee. Thanks for this! Since we stayed in Ximen (and this writeup inspired me to stay here), this was perfect to explore the area!